There was a lot of congratulatory backslapping at last Thursday’s annual gala of the Greater Charlotte Hospitality & Tourism Alliance (HTA), and rightly so. From being a rather small part of the city’s economy two decades ago, tourism has zoomed past the $7 billion milestone seemingly in no time, boosted by the equally rapid rise of the city’s role as a regional business and financial center, as well as its emergence as a thriving hub for professional and amateur sports. The Charlotte Regional Visitors Authority (CRVA), for its part, has done a phenomenal job, in this very short time, working with city and county planners, along with the private sector, to develop a robust tourism infrastructure, including top-tier hotels in the Uptown business center, cool neighborhoods with a diverse dining and entertainment offering, a world-class convention center, and a Top 10 international airport. The pace has been meteoric, which explains the broad smiles at the HTA’s largest-ever gala. And the feeling one got at the activity is that this is only the beginning, for the rousing success in business and sports tourism suggests bigger and better things to come, particularly if Charlotte turbo charges a bid to become just as prominent a player in vacation and leisure travel. Consider this: according to the U.S. Travel Association, business tourism represents less than a third of total travel nationwide, or 31.3%. Leisure accounts for a whopping 68.7%. 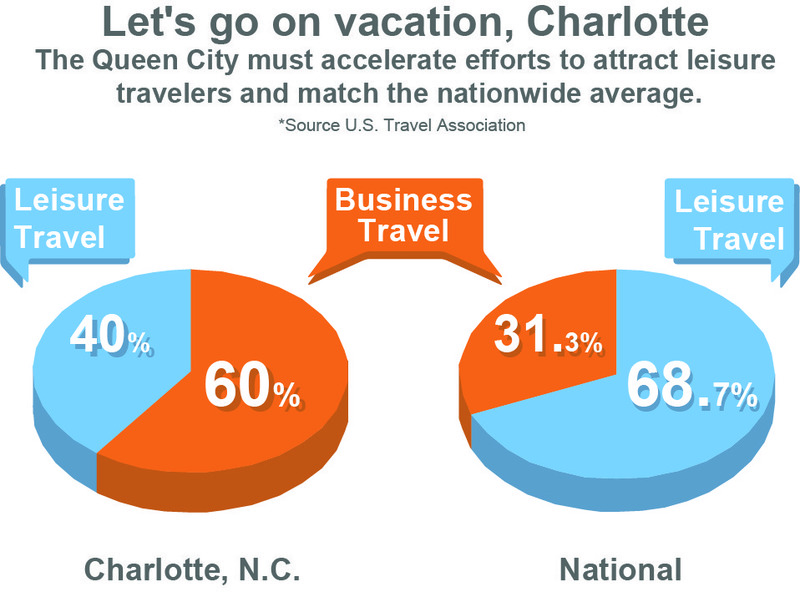 In Charlotte, by contrast, business accounts for 60%, while leisure comes in at 40%. The latter is split 20% sports-related and 20% vacation travel. Business and sport will surely continue to rise, given the efforts behind both fronts by HTA, CRVA, the Chamber of Commerce, and others. But clearly, where the city stands to make the biggest gains and align with the U.S. national trend is in non-sport leisure and vacation travel, which must grow going forward at a significantly faster clip than business and sport, even as these two vital segments grow without interruption! The stakes are certainly high. Leisure’s expansion at this magnitude will mean billion$$ more in job creation and economic activity for the city. It is also an important catalyst to accelerate ongoing efforts by planners and developers to create greater density in certain high-traffic neighborhoods and turn Charlotte into a more modern, sustainable city. As fate should have it, the stage is all set. A quick Google search of the top leisure-travel city destinations in America reveals a number of reputable lists: U.S. News & World Report, Travel & Leisure, Huffington Post, Lonely Planet, Escape Here, Voice of America and others. Some cities are regulars across the board: New York, Chicago, Los Angeles, San Francisco, Seattle, Las Vegas, Denver, Austin, New Orleans, and of course, Orlando. Call them the Big Ten, to use a football analogy. Charlotte, understandably, does not appear on any list, given that this has not been the city’s focus of attention thus far. But two drivers indicate beyond a doubt that the moment we do home in on this lucrative segment and position the city accordingly, Charlotte will join the nation’s leaders, and do so fairly quickly. 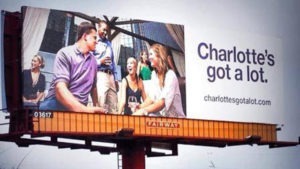 While Charlotte does not yet show up on these rankings, five nearby cities regularly do: Nashville, Asheville, Charleston, Atlanta and Savannah. Get where this is going? This is squarely Charlotte’s zone. The five cities practically surround CLT. When travelers come to the South, they come to this region! All we have to do is get in the game. Which brings us to the second driver. A quick read of all those lists, particularly the description of what attracts travelers to our five popular neighbors, reveals that Charlotte already has what it takes to compete. As our slogan says, we do have a lot! 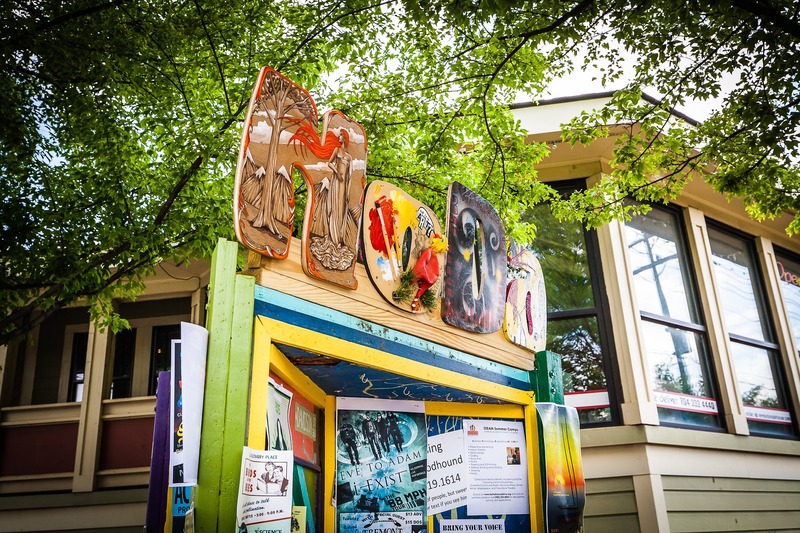 History, dining, entertainment, museums, music, art, nature, and most importantly, that smooth and contagious southern hospitality and friendliness. It would seem, therefore, that all we have to do is turn on an effective city branding and marketing effort to get the word out and for the tourism industry to otherwise become atuned to this new customer base. On this front, we suggest doubling down on the New South concept. In this prior post, we suggested calling it South Anew, but we realize there’s considerable equity invested in New South. The status quo, that is, boosted by powerful marketing, is a great start, and it suffices if the objective is merely to get on the lists and join our five regional brethren. But why not aim higher? The opportunity is clearly on the table for Charlotte to become one of the Big Ten, and why not a Big Five — not just a southern destination, but a top leisure destination that is the linchpin of the South and that people adore and return to because it offers a truly unique southern experience. This level calls for something more than marketing and the status quo. We need to design and develop more attractions and activity hubs in the city, including a new generation of iconic spots distributed along a well-defined corridor, the 20-mile Blue Line being our recommendation. It’s where our new leisure tourists will descend, as will the continuing growing number of business travelers. This includes the spots mentioned above — dining, entertainment, museums, music, art, nature, more! — plus dozens of quaint, niche and thematic hotels, hostels and poshtels that Charlotte does not offer today, at least not yet enough to house the number of travelers we are sure to attract. That same prior post introduced the thinking behind those spots from the perspective of a city facing density urgency in light of the next million residents coming in only the next two decades. In this post, the focus is millions of new visitors. Density not only saves taxpayers billion$$ in suburban-stretch infrastructure and slashes the cost and frustration of distant commutes for citizens. It is also the centerpiece of urban sustainability, including reduced carbon, greater use of mass transit and alternative mobility, lower water consumption, smarter waste management and thriving local business. And here’s the thing. The march toward density tends to be slow everywhere. In the case of Charlotte, bringing millions of new visitors to the neighborhoods along the Blue and Gold transit lines will vastly accelerate the creation of all those spots to serve tourists, and that in turn will accelerate the wave of residents moving into those same districts, including the Next Million. They will all love Charlotte’s organic communities, such as historic South End, funky NoDa and ethnic Plaza Midwood, as well as master-planned developments like Uptown and the new mega-projects now in the works: Brooklyn Village, North Tryon, Camp North End, University City, Scaleybark South Village, River District and others. The spots, both organic and master-planned, should also be layered with a series of places designed to be iconic — as in colorful and sculptural, at times dramatic to the eye, always functional, definitely memorable — some full of amenities, all interconnected in a vibrant, authentic, human-scale urban architecture that defines the unique New South experience that is lived in Charlotte as in no other place in the region. When it all comes together, who can doubt that the Queen City will burst into everyone’s list of the Top Five Cities to Visit in the United States of America.